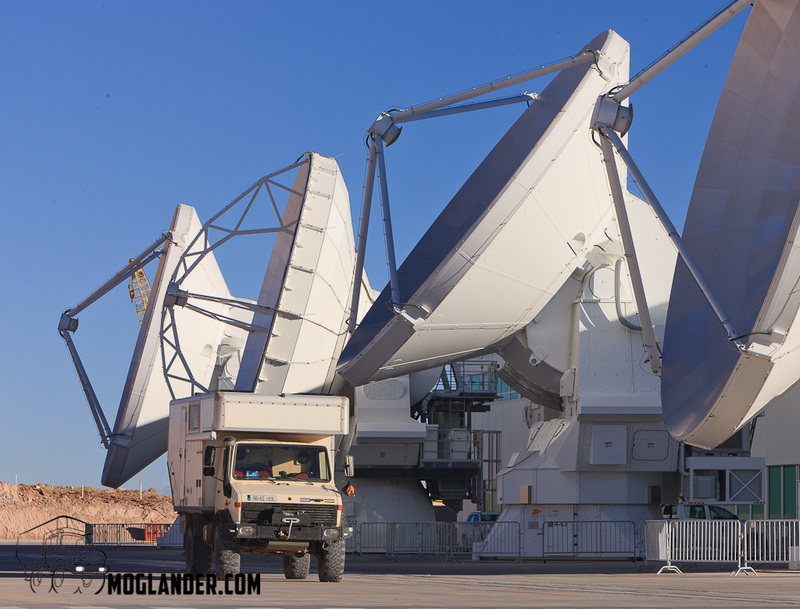 Moglander is dwarfed by the high precision antennas. If Carlsberg were to make the best stargazing location in the world, it would probably be the Atacama Desert in Northern Chile. When you visit the main tourist town, San Pedro de Atacama you will immediately see loads of tour companies with telescopes outside their doors, advertising their stargazing night-time trips into the Desert. Interestingly enough the best star-gazing tour company has no such telescope outside their office, which is simply called Space. After we had spent some time here in the Atacama (and previously in the Salar de Uyuni), we have gotten more interested in the night skies as it is so easy to see it so clearly here. As we learned more, we recalled a documentary we saw on TV before we started our trip and it was about the largest radio telescope that anyone ever tried to build. It is called ALMA (Atacama Large Millimeter Array) and it’s right beside us in the Atacama desert. 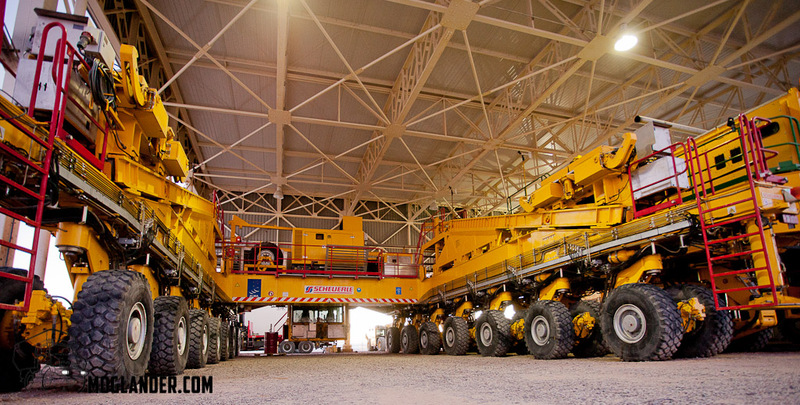 ALMA are not receiving visitors, and it’s a closed site however they do allow media visits, and after making contact and explaining what we are doing in South America we received permission to visit the site, and take a look around. We felt lucky, as this would be a real treat. On the day we had arranged, we headed up to ALMA. They have a security building at the end of the road up to the site, and we had to sign up for our security briefing. A large part of this is about safety, and since there is so much construction and change going on that makes sense. Merv, as the driver, even had to have a breathalyzer test as there is a no alcohol policy, and if you fail the breathalyzer test, you cannot enter! Next, they took out a digital thermometer to make sure we did not have a fever, another reason you would not be allowed to visit. Once we got through that process, we were allowed to drive from the security building to reception. This is a mainly straight road, and we were given the instructions to take the second right. Off we went! 20 minutes later, we took another photo, and yes, we were still driving! Once we got to reception, we were welcomed very nicely, and were met by a member of the safety team whose job it was to accompany us around, and make sure we were safe. I don’t think there was any fear of us running away with a telescope….. Once we were parked up, and had taken our few photos, he introduced us to an astronomer called Juan Rodrigo Cortés. This was a bonus for us as we got to find out a little about life working at over 3000 metres. Juan probably knows more about other planets than he does about this one, certainly he knew his way around a galaxy or 2 better than we knew our way around Chile! 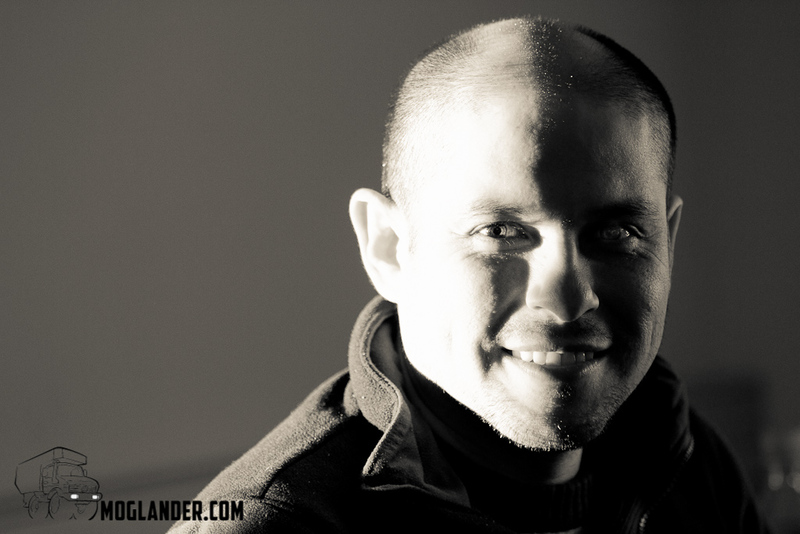 We asked about what it was like to work on such a site, and Juan proudly told us that working at ALMA was the most challenging in astronomy. During the few nights before our visit, they had over 100mph winds, and temperatures of -12 Celsius, which was lower than -40 Celsius when you include the wind chill factor. During these conditions, they did not stop the receivers, they had to stay working. This is a pretty Extreme site, everything is a bit tougher than normal. At most outside doors, there are factor 50 suntan location dispensers due to the very high radiation levels from the sun, the sunshine through the windows is so strong that full blackout blinds are needed if you want to be able to read your computer screens. We were surprised that Juan’s work station was just like any other office job. No blackboard and chalk, no telescopes, no globes, no hanging mobiles of stars, no huge box of charts. All the work is computerized now, and this is as high tech as it gets. They run a supercomputer, but Juan refers to it as a giant calculator. Interpreting all the information that ALMA captures is a bit like sifting through a box of clues, and that’s where the skill comes in. They can tell what chemical compounds are in different parts of space by the colors of it burning for example. The idea of ALMA is to have a 16 Sq Kilometer sized telescope dish, but as that is not really practical in a machine that must be able to move, they will have over 60 separate smaller telescope receivers, each one 12 metres in diameter, and have them all integrated to act as one large dish. They have been building this for a few years now, and it’s not yet finished, however there are 33 dishes up and running already. 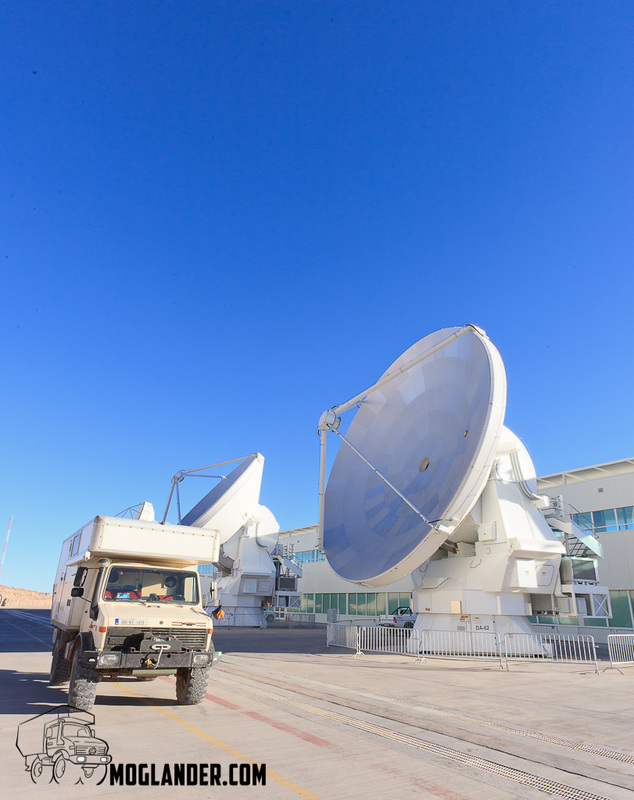 in 2012 when they had just 16 dishes up and running they were able to start work and capture some of the ALMA’s first images. Some of these images are available on the ALMA website, and are simply stunning! 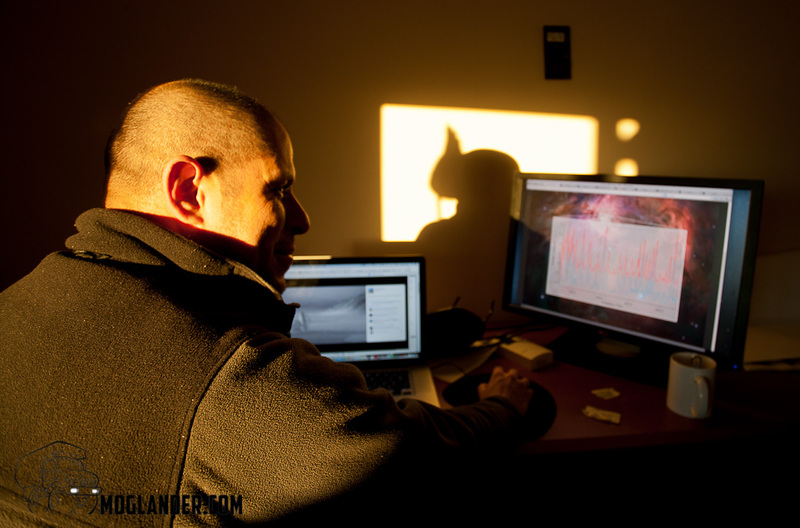 Juan works in pretty extreme lighting conditions every day. Blinding sunlight or pitch black dark. 28*28 beats 4*4 any day. 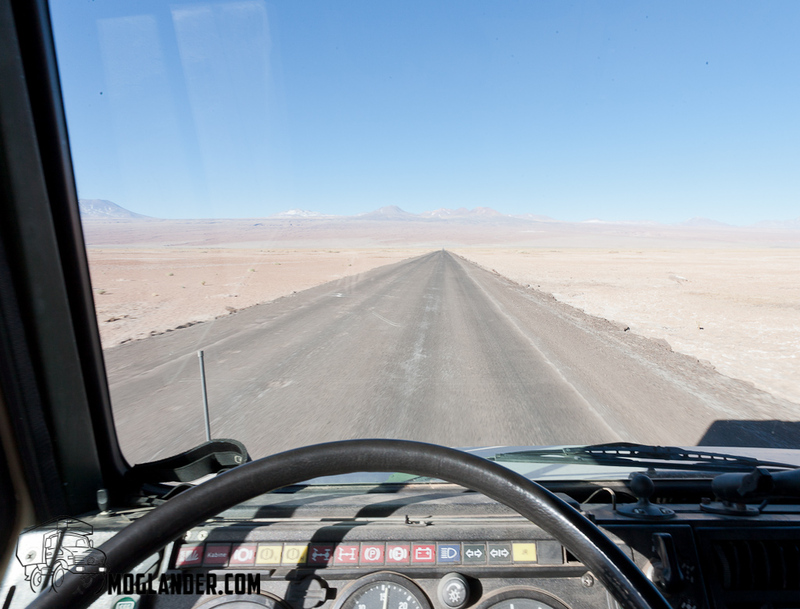 ALMA’s transporter is an amazing machine. 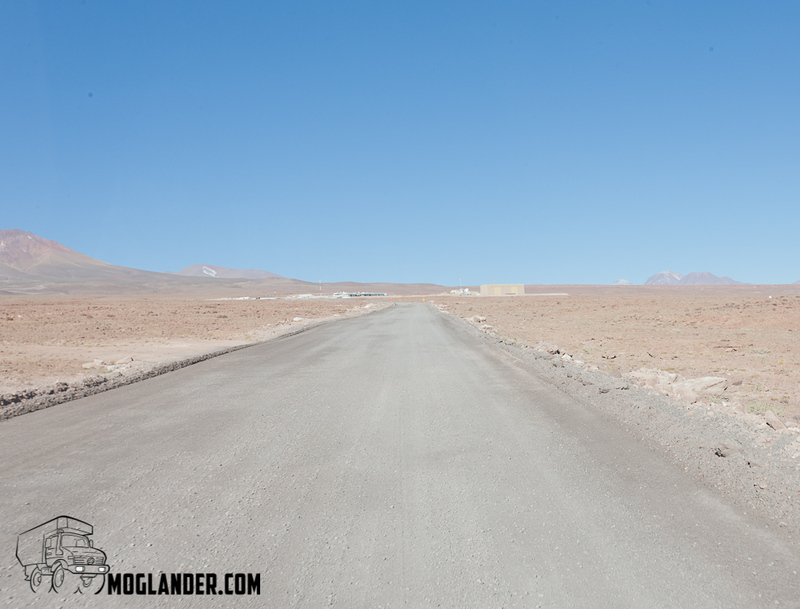 Working at the ALMA location means you can be on-site for 8 days maximum, then take 6 days off at a lower altitude, or back at one of the other lower altitude ALMA offices. Only then can you go back up to the higher site. The actual antennas are located over 5,000 metres above sea level, so working up there is especially tough. There are between 200 and 300 people working on the site, and due to it’s location, there are no handy nightly trips into town for a little R&R! The site is completely self contained, with a Gym, canteen, Cabanás (little houses) and of course, great working conditions. We were really impressed by how clean and organized the whole place is. Of course, you will have to get along with your work colleagues 24*7 from Japan, Italy, Spain, USA, Australia, Germany, France…. The real question is how do they get these huge high precision antennas up to the higher site, which is over 5000 metres. The antennas go up the mountain fully assembled AND working while they go up. 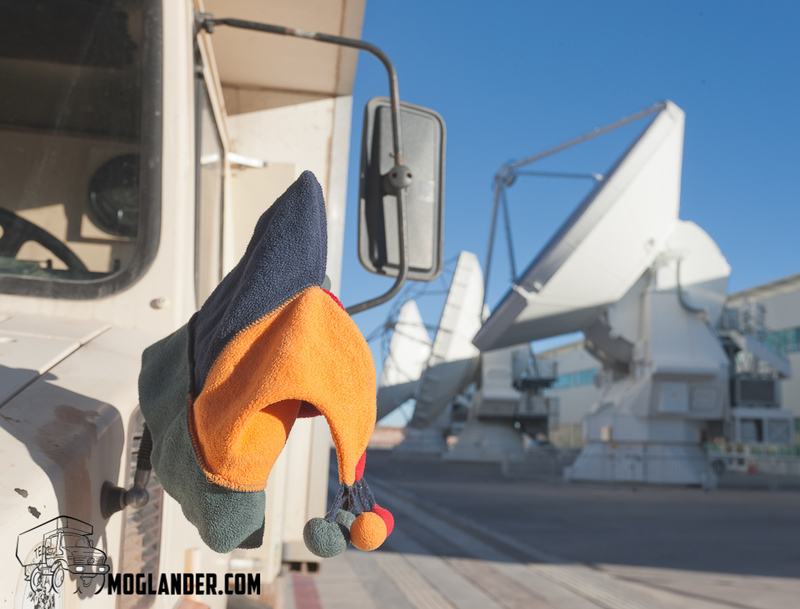 This means their transporter must provide power to the antennas as they are transported up the mountain. No problem for this machine.